So writes Michael (http://theeconomiccollapseblog.com) in edited excerpts from from his original article entitled Are We On The Verge Of Witnessing The Death Of The Paper Gold Scam?. A Hat Tip goes out to SeniorD for bringing this article to my attention. (NOTE: This post is presented by Lorimer Wilson, editor of www.FinancialArticleSummariesToday.com and www.munKNEE.com and the free Intelligence Report newsletter (see sample here – register here). The article may have been edited ([ ]), abridged (…) and/or reformatted (some sub-titles and bold/italics emphases) for the sake of clarity and brevity to ensure a fast and easy read. The legal claims on physical gold far exceed the amount of physical gold that the banks actually have by a very, very wide margin and right now the bankers are scared out of their wits because their warehouses are being drained of physical gold at a frightening rate. So what happens when their physical gold is gone but they still have lots and lots of people with legal claims to gold? It will represent the end of the paper gold scam. Many believe that the recent takedown of the price of paper gold was a desperate attempt by the bankers to put off the day of reckoning, but it appears to have greatly backfired on them. Instead of cooling off demand for precious metals, it has unleashed a massive “gold rush” all over the globe. Meanwhile, word has been spreading among wealthy families in both North America and Europe that they had better grab their physical gold out of the banks while they still can. This is creating havoc in the financial community, and at least one major international bank has already declared that it will only be settling those accounts in cash from now on. “So we see all of these paper (trading) volumes going through that bear absolutely no relationship to what’s going on in the physical markets. As you know I have always been a proponent of the fact that supply in the gold market was way less than demand, and by a very large factor. I think demand exceeds supply by at least 60%. The central banks are surreptitiously supplying that gold, and ultimately they will be running on fumes. “FACT #1: COMEX gold vaults were recently drained of 2 million ounces of physical gold in one quarter, the largest withdrawal of physical gold bullion from COMEX vaults in one quarter during this entire 12-year gold and silver bull. 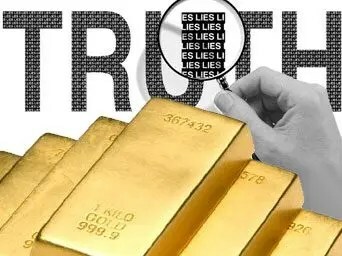 There has been speculation about the reasons that spurred these massive withdrawals of gold from COMEX vaults, but the most reasonable speculation is that no one trusts the bankers to hold on to their physical gold anymore, especially in light of Fact #2. Note below, that both registered AND eligible stocks of gold had heavily declined in recent months. Such an event signals a general distrust of the banking system from everyone holding gold in registered COMEX vaults. FACT #2: One of the largest European banks, ABN Amro, defaulted on their gold contracts and informed their clients that they would only settle their gold bullion contracts in cash and not in physical. So much for the supposed legality of financial contracts as a “binding” contract. So whether Fact #1 caused Fact #2 or vice versa is irrelevant. What IS apparent is that the level of trust in bankers to safekeep physical gold and physical silver is disappearing, as it should be, and as it should have already been for years now. Truth always takes some time to catch up to banker spread lies and that is what is happening now. I have been warning people never to trust bankers in deals involving gold and silver for years now…In an article I wrote nearly four years ago I informed the public that the SLV and GLD were likely a banker invented scam as well. “I think the reality is the supply situation is extremely volatile at this point, and even discussing it is like rubbing a raw nerve to the people who are in charge. The amount of discussion on the subject of warehouse supply, supply that is represented by the gold leases, indicated to the central planners that the demand for physical was going to continue to effect the exchanges. “Another indication of the demand for large bars is the huge drawdown in the gold stock in COMEX warehouses. It is noteworthy that COMEX reports show the drawdown is largely the result of dealers removing their inventory, their working stock. When that happens, you know the availability of supply is constrained. What all of this means…[is that] if the central planners want to keep the precious metals at these low prices, to meet the demand for physical metal they will need to empty more metal from central bank vaults, or borrow metal from the ETFs as some have suggested is happening. Otherwise, the central planners will have to step back and stop their intervention, thereby letting the price of gold and silver rise so that demand tapers off, bringing demand and supply of physical metal back toward some kind of balance. And then I get a call from a close friend in NYC last Friday. His career has been in private wealth management in the private bank department of the Too Big To Fail banks. He’s been looking for work and chats with old colleagues all the time. He called my Friday and told me he just got off the phone with a very high level private banker from a big Euro-based TBTF bullion bank, but who was at JP Morgan until about six months ago. Regarding the ABN/Amro situation, they offered a gold investment account product that offered physical delivery of the gold in the investment account when the investor cashes out. About a week before the gold price smash, ABN sent a letter to its clients informing that the physical delivery of the bullion was no longer available and that all accounts would be settled with cash at redemption. We are also seeing a rapid decoupling between spot prices and physical prices. In fact, it is quickly getting to the point where the spot price of gold and the spot price of silver are becoming irrelevant. For example, demand for silver coins has become so intense that some dealers are charging premiums of up to 30 percent over spot price for silver eagles. That would have been regarded as insane a few years ago, but people are now willing to pay these kinds of premiums. People are recognizing the importance of actually having physical gold and silver in their possession and they are willing to pay a significant premium in order to get it. Everyone personally holding physical gold and silver, as we have been recommending, has no margin call to meet and no reason to sell. This is a temporary situation, and it will pass. Now is not the time to panic, as that is the intent of the central planners/bankers in forcing gold and silver through strong support levels. Stay the course. To the extent you can, continue buying the physical metal. 7. You’re Being Played! Don’t Sell Your Gold! It’s Going MUCH Higher – Soon! David Mcalvany covers the reasons behind the major pullback in metals on April 12, and where they may go from here, in this most enlightening and re-assuring 8:14 minute video. 9. Irrationality Reigns In the Gold Market: What Is Going On? I have no problem with corrections in general, as they are a healthy part of any bull market and provide a platform from the which the next upleg can spring but something is not quite right about the recent price action in precious metals as the markets have become increasingly divorced from reality over the past few months. Let’s look at some of the glaring contradictions and then discuss the implications. Previous Does Behavior of “We the People” Suggest Central Bankers Have Gone Too Far? Investors trust in the paper PM market is now starting to separate itself from their trust in the physical PM market, which I think is really good for personal investors because the paper market has now been proven to be easily “gamed” by the biggest players who have control over not only the posted PM values but also the ability to close trades quickly! The physical PM market, on the other hand remains a much more level playing field for all. Sure there are those with very large holdings that can cause market movements, like in the 80’s, when the Hunt Brothers caused the Silver market to skyrocket but because the total about of physical Silver (and Gold) is “limited,” selling naked shorts will never have the same effect on the physical market. This separation in trading accountability could in itself create a new level of TRUST in physical PM’s (at exactly the time when more investors globally than ever before are worried about long term fiscal solvency), that if widely accepted would add to PM’s value both now and in the future! In addition to the above differences between paper and physical PM’s, I believe that it is important to add that since many acquire PM’s as a hedge against long term reductions in the value of paper currencies. Plus, the ability to actual have control over their PM’s is important since that removes several layers of Trust in the System, which is required by paper holdings (both PM’s and or currency). Owning physical PM’s also allows these same investors to trade/barter among themselves should the opportunity arise, which could lead to additional savings while at the same time keeping these transactions completely private.